Kit preview of PNT's 1/1400 Ennex O'Won. Scale: 1/1400 - right at 6 & 21/32" (6.6562 inches) / 16.85 cm long. Overall Rating: 9 - Nice kit, looks like a great weekend project! Please Be Aware that Starship Modeler has received a number of reports of orders not being shipped in a timely manner, if at all, by this company. We strongly encourage you to get in contact with them first to make sure products are in stock and available for shipping. Polar Lights will be releasing a good-sized, fully licensed plastic model kit of the NX-01 Enterprise in mid- to late- 2003. 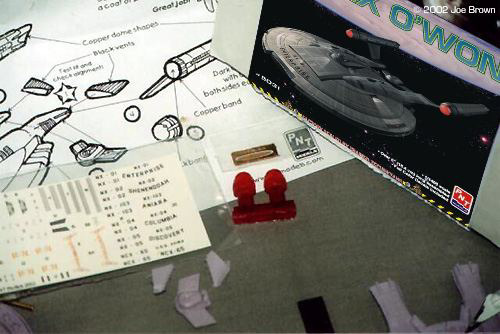 Starship Modeler recommends you wait for that kit. 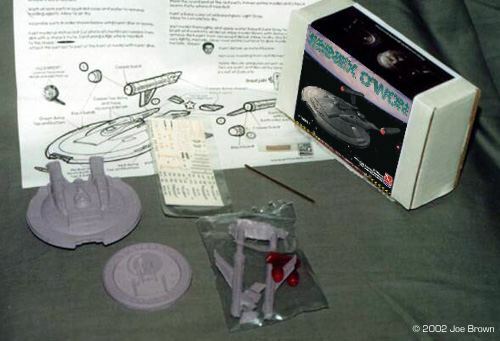 ^ Photoetch, decals, bussard collectors PNT Models promised, and has now delivered, the first kit of the Ennex O'Won. The box itself is very sturdy, and survived a weekend of being lugged around an IPMS event in my backpack. Opening the box showed the warp nacelles, the two impulse engine exhausts, and their connector, all in a sealed bag that also held the Bussard nacelle caps. The main hull/saucer section and the 'shoulder-patch' resin base were loose, as was the brass rod to mount the ship upon. The photo etch deflector dish is bagged separately, and taped to the lid of the box. 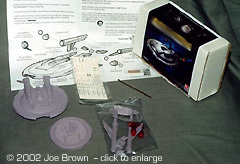 A full size, double sided instruction sheet is included, along with a decal sheet. The lavender shaded resin is a bit of a color surprise, but it won't matter at all once it's primed and painted. 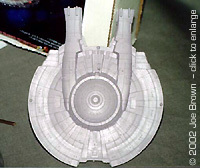 Like many resin Starfleet model releases, the Ennex O'Won is in 1/1400 scale, allowing you to show it off with most of the ERTL Star Trek armada in a consistent scale. 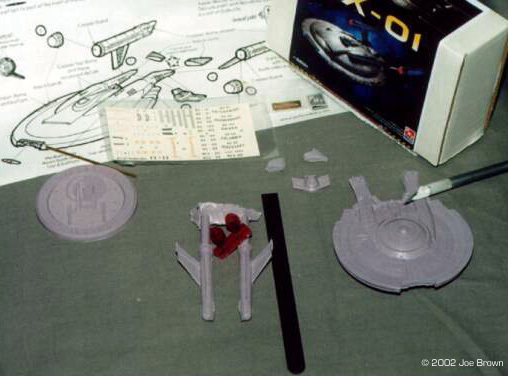 Inside the sturdy box are seven lavender resin pieces (which make up the ship and the base), two clear resin pieces tinted red (Bussard scoops), decals and instructions. The resin bits are almost entirely clear of defects (duh, it's a brand new mold! ), though I did find a few tiny, tiny bubbles hiding near the aft section of the hull, on the 4 small 'joiner' pieces that fit under the impulse engines, and a barely noticeable mold seam along the aft hull booms. The red Bussard scoops are almost water clear, and free of bubbles. The base is incredibly well done for this model, and could be used 'as is'. I'll mount it on a painted wood display stand, and then the completed ship on top of that. Detail is wonderfully crisp and clean throughout and consists of engraved windows and panel lines, and a surprising number of raised hull panel sections. The only flaws I could find were that several of the windows along the aft edge of the primary hull's rim are a hair crooked. However, it's really not apparent at all unless you put your eye within five inches from the model, so I have no issues with that. A fairly extensive waterslide decal sheet is provided. 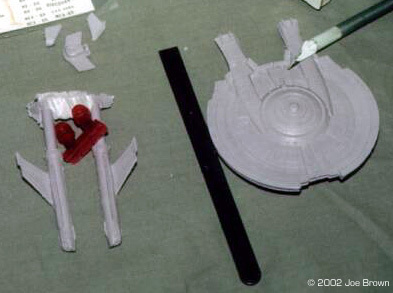 Markings are additionally provided for NX-02 Shenendoah, NX-04 Columbia, NX-05 Discovery, NCX-65 Akira, NX-103 Aniara. The decals are perfectly registered and of very high quality. There is a double sided instruction sheet is included, along with a decal sheet. A simple but clear assembly and painting guide on one side, and a decal placement guide on the flip side. Almost all of it is taken up by diagrams showing decal placement and painting notes. Is it accurate? As far as I can tell with my resources, yes. It matches what I have been seeing on television, and also the stills that I have seen around on the 'Net. Assembly should be a no-brainer. Wash and clean all the parts, clean up the minimal seam lines. Impulse end caps go on the booms, followed by the small aft hull section. The warp nacelles get their Bussard caps, which get masked. The nacelles get glued on their booms. . After that, prep, prime, and paint the model, add decals, then clear coat. The instructions advise attaching the Bussard scoops, and then masking them off. That seems a bit risky, but, I will give it a try that way on this model. Fit of the main pieces is superb. Dry-fitting of the pieces to check their fit indicates that this model will go together very smoothly. The amount of detailing effort that went into this model (especially the saucer section!) is amazing. About the design, love it or hate it, call it the Akira-prise, time-travel design rip-off, Berman being lazy -- all stipulated. But if you like the new series, then this model of this ship should be in your resin kit collection. Me, I love it. I happen to really like the design, and, the kit looks simple enough to be done over a weekend, assembled and painted. Very highly recommended! Many thanks to Joe's wallet for providing the review sample. Manufacturers and retailers, interested in getting your wares reviewed and publicized on a site averaging 2000+ readers a day? Contact us! This page copyright © 2002 Starship Modeler. Last updated on 3 January 2003.